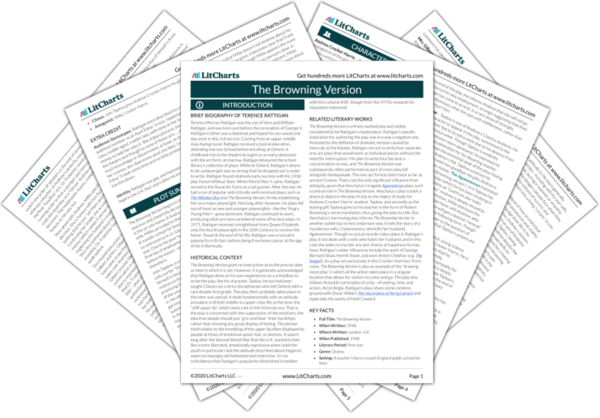 Instant downloads of all 946 LitChart PDFs (including The Browning Version). 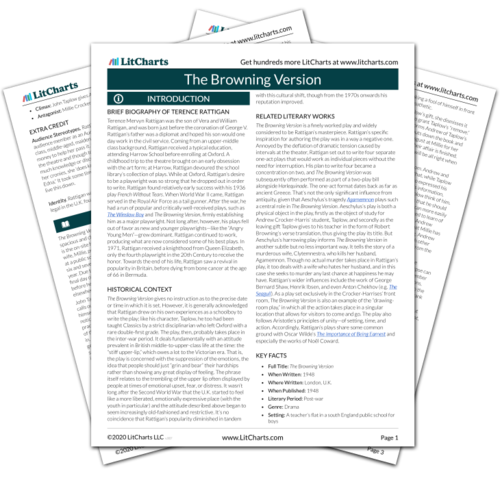 Welcome to the LitCharts study guide on Terence Rattigan's The Browning Version. Created by the original team behind SparkNotes, LitCharts are the world's best literature guides. A concise biography of Terence Rattigan plus historical and literary context for The Browning Version. A quick-reference summary: The Browning Version on a single page. In-depth summary and analysis of every of The Browning Version. Visual theme-tracking, too. Explanations, analysis, and visualizations of The Browning Version's themes. The Browning Version's important quotes, sortable by theme, character, or . Description, analysis, and timelines for The Browning Version's characters. Explanations of The Browning Version's symbols, and tracking of where they appear. An interactive data visualization of The Browning Version's plot and themes. Terence Mervyn Rattigan was the son of Vera and William Rattigan, and was born just before the coronation of George V. Rattigan’s father was a diplomat and hoped his son would one day work in the civil service. Coming from an upper-middle class background, Rattigan received a typical education, attending Harrow School before enrolling at Oxford. A childhood trip to the theatre brought on an early obsession with the art form; at Harrow, Rattigan devoured the school library’s collection of plays. While at Oxford, Rattigan’s desire to be a playwright was so strong that he dropped out in order to write. Rattigan found relatively early success with his 1936 play French Without Tears. When World War II came, Rattigan served in the Royal Air Force as a tail gunner. After the war, he had a run of popular and critically well-received plays, such as The Winslow Boy and The Browning Version, firmly establishing him as a major playwright. Not long after, however, his plays fell out of favor as new and younger playwrights—like the “Angry Young Men”—grew dominant. Rattigan continued to work, producing what are now considered some of his best plays. In 1971, Rattigan received a knighthood from Queen Elizabeth, only the fourth playwright in the 20th Century to receive the honor. Towards the end of his life, Rattigan saw a revival in popularity in Britain, before dying from bone cancer at the age of 66 in Bermuda. 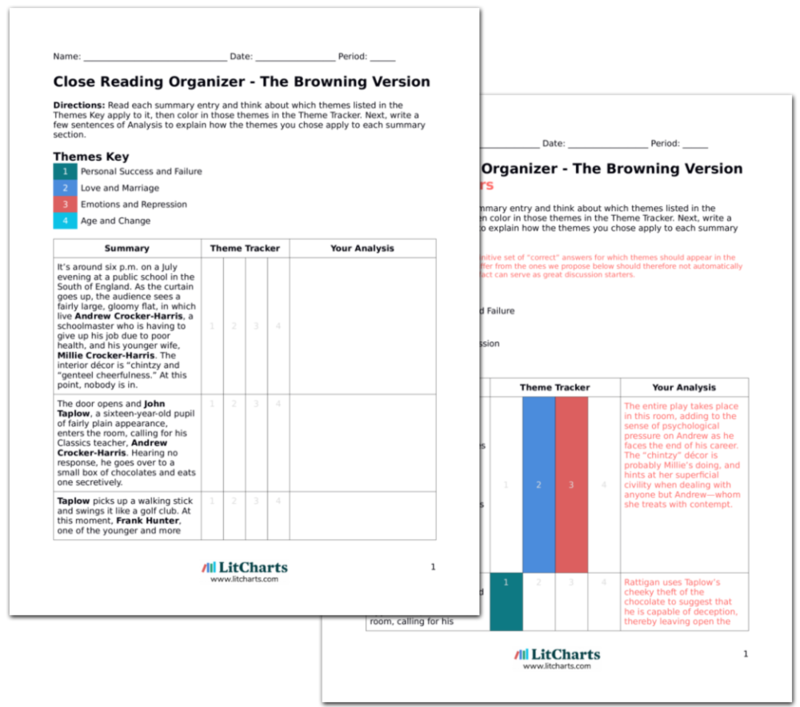 Get the entire The Browning Version LitChart as a printable PDF. The Browning Version gives no instruction as to the precise date or time in which it is set. However, it is generally acknowledged that Rattigan drew on his own experiences as a schoolboy to write the play; like his character, Taplow, he too had been taught Classics by a strict disciplinarian who left Oxford with a rare double-first grade. The play, then, probably takes place in the inter-war period. It deals fundamentally with an attitude prevalent in British middle-to-upper-class life at the time: the “stiff upper-lip,” which owes a lot to the Victorian era. That is, the play is concerned with the suppression of the emotions, the idea that people should just “grin and bear” their hardships rather than showing any great display of feeling. The phrase itself relates to the trembling of the upper lip often displayed by people at times of emotional upset, fear, or distress. It wasn’t long after the Second World War that the U.K. started to feel like a more liberated, emotionally expressive place (with the youth in particular) and the attitude described above began to seem increasingly old-fashioned and restrictive. It’s no coincidence that Rattigan’s popularity diminished in tandem with this cultural shift, though from the 1970s onwards his reputation improved. The Browning Version is a finely worked play and widely considered to be Rattigan’s masterpiece. Rattigan’s specific inspiration for authoring the play was in a way a negative one. Annoyed by the deflation of dramatic tension caused by intervals at the theater, Rattigan set out to write four separate one-act plays that would work as individual pieces without the need for interruption. His plan to write four became a concentration on two, and The Browning Version was subsequently often performed as part of a two-play bill alongside Harlequinade. The one-act format dates back as far as ancient Greece. That’s not the only significant influence from antiquity, given that Aeschylus’s tragedy Agamemnon plays such a central role in The Browning Version. Aeschylus’s play is both a physical object in the play, firstly as the object of study for Andrew Crocker-Harris’ student, Taplow, and secondly as the leaving gift Taplow gives to his teacher in the form of Robert Browning’s verse translation, thus giving the play its title. But Aeschylus’s harrowing play informs The Browning Version in another subtle but no less important way. It tells the story of a murderous wife, Clytemnestra, who kills her husband, Agamemnon. Though no actual murder takes place in Rattigan’s play, it too deals with a wife who hates her husband, and in this case she seeks to murder any last chance at happiness he may have. Rattigan’s wider influences include the work of George Bernard Shaw, Henrik Ibsen, and even Anton Chekhov (e.g. The Seagull). As a play set exclusively in the Crocker-Harrises’ front room, The Browning Version is also an example of the “drawing-room play,” in which all the action takes place in a singular location that allows for visitors to come and go. The play also follows Aristotle’s principles of unity—of setting, time, and action. Accordingly, Rattigan’s plays share some common ground with Oscar Wilde’s The Importance of Being Earnest and especially the works of Noël Coward. Audience Stereotypes. Rattigan once described his ideal audience member as an Aunt Edna: “a nice, respectable, middle-class, middle-aged, maiden lady, with time on her hands and the money to help her pass it. She enjoys pictures, books, music and the theatre and though to none of these arts … does she bring much knowledge or discernment, at least, as she is apt to tell her cronies, she ‘does know what she likes’. Let us call her Aunt Edna.” It took some time and no little protestation for him to live this down. Identity. Rattigan was gay, and homosexuality was only made legal in the U.K. four years after his knighthood. Howard, James. "The Browning Version." LitCharts. LitCharts LLC, 6 Dec 2018. Web. 11 Dec 2018. Howard, James. "The Browning Version." LitCharts LLC, December 6, 2018. Retrieved December 11, 2018. https://www.litcharts.com/lit/the-browning-version.